You may have noticed a change in the forums, and especially community.infragistics.com. Not only have we updated the site to be easier to use and find data, we've also added a bunch of new content! If you run into any problems with the new site, you can add a reply to this post with your issue. We have a short list of known issues at this point that we're working hard to correct. I will update this post as the issues are found and resolved. Missing Avatars, Profiles: During the transition to the new system, some profiles were cleared. Your user login should still work fine, but if you uploaded an avatar, it may be missing. We're working to try and get the info back, but recommend you upload a new avatar and update your profile information. Missing "My Discussions" from forums list: We're working to get this shortcut back in the main page, until then you can go directly to https://www.infragistics.com/community/forums to see all posts that you are involved in. Some of the Media items don't play: Some of the screencasts encodings are not supported by Silverlight. We're working to get those re-encoded. In the meantime, you can download the video and play it in Windows Media Player. Search: Searching provides results for all forums, need a way to search a specific forum or group. IE6: There are display problems with IE6. Missing Images: Some forum posts are missing images, or the images are not showing up properly. Thanks for the report Ed! I'll write up the search results formatting as an issue. Something doesn't look right to me either. Where did the search within a forum functionality go? The search located at the top right searches the entire community site. 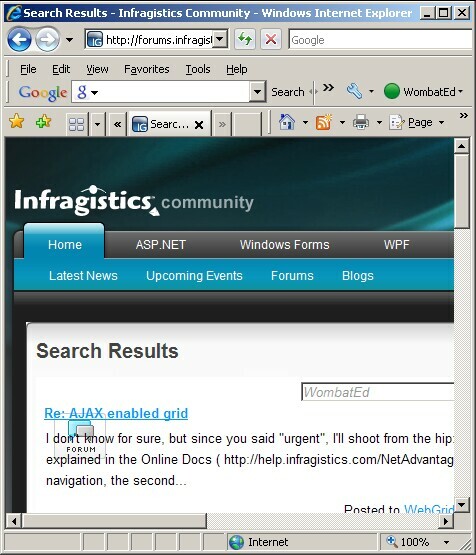 IE: What if I want to search for ContentPane within the infragistics WPF XamDocManager forum only!! Can't seem to find a way to simply search a forum or its subforums.